Today Harrison H. (Jack) Schmitt and his wife Teresa were welcomed in the famous Roosevelt Room of the White House for the signing of the Space Policy Directive by President Trump. The document officially directs NASA to return Americans to the Moon and establish a base of operations for missions to Mars. 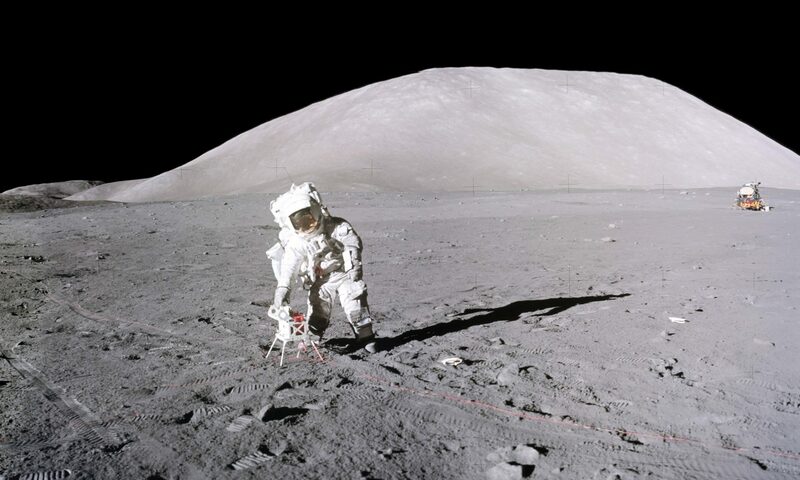 Today also marks the 45th anniversary of the landing of Apollo 17’s Challenger in the Valley of Taurus-Littrow in 1972, and the moment when Schmitt became the last American to set foot on the Moon in the 20th century. The President shaking hands with Dr. Schmitt (White House video frame, 12/11/2017). Dr. Schmitt presents President Trump with an astronaut figurine after he signed the directive. At left on the desk is a container with a portion of lunar sample 70215, the largest rock returned from the Apollo 17 mission, weighing 8.11 kg (17.88 lbs) (White House video frame, 12/11/2017). A NASA announcement of the ceremony is on their website; and a White House video of the 7.5 min ceremony can be viewed here. The text of the President’s and Vice-President’s remarks can be read here together with a list of people attending. The White House has released a copy of the directive signed by the President [click here]. Dr. Schmitt and the President’s daughter Ivanka discuss the size of lunar sample 70215 from a very fine-grained basalt lava rock (White House staff photo, 12/11/2017). Harrison H. Schmitt with his wife Teresa Fitzgibbon in the White House reception area during the Space Policy Directive signing ceremony (NASA staff photo, 12/11/2017). Stuart Varney’s interview with Dr. Schmitt the following morning on the Fox Business Network regarding the Trump Directive to return Americans to the Moon is No. 1 on the Interview page (under “About Harrison H. Schmitt”), or accessible by clicking here.